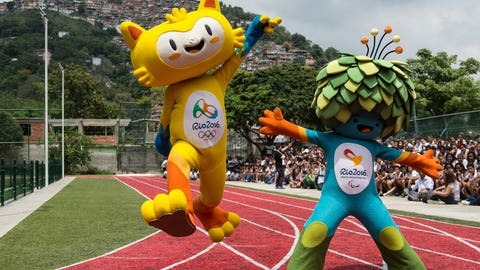 Overjoyed: The Rio 2016 Olympic Games mascots. RIO DE JANEIRO — Organizers of the 2016 Olympics in Rio de Janeiro said Wednesday they have matched the domestic sponsorship revenues for the 2012 Games and expect to surpass London’s total with almost two years to go. Renato Ciuchini, the chief commercial officer of the Rio Games, said Rio has already earned 2.6 billion reals ($1 billion) in sponsorship sales, amid fluctuating exchange rates. London raised about $1.1 billion from domestic sponsors. "We matched the numbers of London already," Ciuchini said. Ciuchini said Rio had reached about 85 percent of its local sponsorship sales goal despite a slumping economy, the distraction of a recent presidential election, and corruption allegations aimed at Petrobras, Brazil’s state-run oil giant. He termed the recent World Cup "a good thing for us" in stimulating sales. 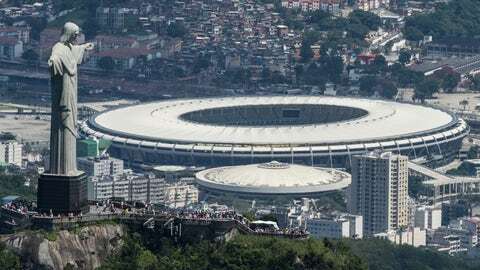 Despite being poised to overtake London’s domestic sponsorship, Rio’s sales may still fall short. Organizers expected them to make up about 50 percent of the $3 billion operating budget for running the games. Rio is also spending separately about $20 billion — a mix of public and private money — to build sporting and urban infrastructure for South America’s first Olympics and Paralympics. Brazil spent about $15 billion on this year’s World Cup. Ciuchini’s numbers suggest local sponsorship sales will come in below the 50 percent target. He said any shortfall in reaching a balanced operating budget might be made up for with a "bit of higher revenue in ticketing." He said budget details were continually being adjusted. Olympic host cities are bound by contract to pay for any cost overruns or deficits. Other major income sources for the operating budget are licensing, merchandising and a large contribution from the Switzerland-based International Olympic Committee. Rio has landed six major sponsors including: Banco Bradesco, Bradesco Seguros, Embratel, Claro, Nissan and the government-run postal service Correios. But it has failed to get any major sponsors from five major industries: airlines, utilities, oil and gas, mining and agribusiness. Many of those are key industries in Brazil. Ciuchini said negotiations in those industries "haven’t closed" but he said no new major sponsors were likely to be added. "We don’t believe they will come as tier one (sponsors) here," he said. "Today we are doing very well without them." Reports have suggested that some companies have balked and what have been seen at Rio’s steep sponsorship prices. Organizers do not disclose what sponsors pay, but Rio reportedly got off to a fast start by landing $500 million and meeting early targets. Ciuchini said that Rio will have signed 19 new contracts this year with smaller sponsors. "If we were that expensive, how could we sign 19 contracts in 12 months?" he asked.